Upgrade interposer adapters provide an easy and low cost way to mount more modern smaller footprint package and pitch components to a PCB designed for larger pad patterns. The adapter edge connections match the larger circuit board footprint, and the pads on the adapter top match the smaller component footprint. The adapter pads are wired 1 to 1. The prices below are one each prices. Prices for manufacturing quantities are available upon request. Call 800.686.6428 in the USA or email for quantity price and delivery. 8SSO-SO15-SMT-SD 8 pad Interposer correction adapter from SSOP 3.0mm body width component to SOIC 153 mil body width. 8SSO-SO21-SMT-SD 8 pad Interposer correction adapter from SSOP 3.0mm body width component to SOIC 153 mil body width. 8SSO-SO30-SMT-SD 8 pad Interposer correction adapter from SOIC 300 milbody component to SSOP 3.0mm body width. 20SSO-SO30-SMT-SD 20 pad Interposer correction adapter from 419 milsbody width component package to 208 mil body widht component. 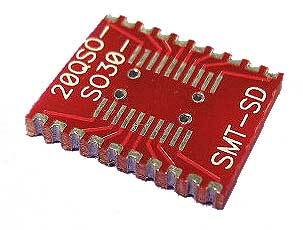 20SSO-18D3-SMT-S-PIC Pic 20 pad Interposer correction adapter from 18 pin DIP rows 300 mil apart component package to 20 pad 208 mil body width at 309 tip to tip. 20SSO-18SO30-SMT-SD-PIC Pic 20 pad Interposer correction adapter from 18 pin pad SOIC rows 300 mil apart component package to 20 pad 208 mil body at 0.65mm pitch. 44QFN26-QFS31-PL-SMT-PIC16 44 pad Interposer correction adapter for use with Microchip PIC16C, PIC16F, PIC18C and PIC18F microcontrollers in 44 QFN, 44 QFP or 44 TQFP packages in PLCC sockets. 48QFS20-QFS31AC-SMT-SD 48 pad Interposer correction adapter for 48 TQFP, 0.5mm pitch parts to QFP PQFP pads with 0.8mm pitch on the PCB. 48QFS20-QFS31B-SMT-SD 48 pad Interposer correction adapter for 48 TQFP, 0.5mm pitch parts to QFP PQFP pads with 0.8mm pitch on the PCB. 48QFS20-QFS31D-SMT-SD 48 pad Interposer correction adapter for 48 TQFP, 0.5mm pitch parts to QFP PQFP pads with 0.8mm pitch on the PCB. 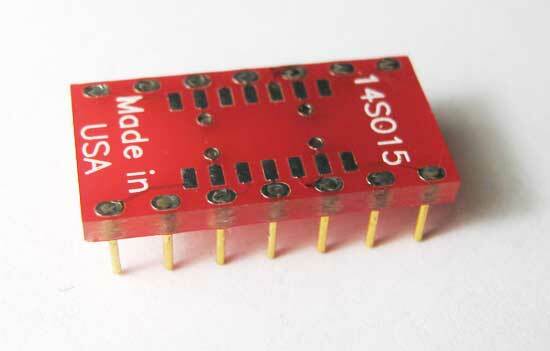 64QFS16-QFS20-SMT-SD 64 pad Interposer correction adapter from 64 TQFP 0.5mm pitch, to TQFP 0.4mm pitch package. 64QFS20-QFS31-SMT-SD 64 pad Interposer correction adapter for 64 TQFP, 0.5mm pitch, to QFP PQFP 0.8mm pitch package. 64QFS16-QFS20-QFS31-SMT-SD 64 pad Interposer correction adapter From 64 TQFP, 0.4mm pitch or 0.5mm pitch to QFP PQFP 0.8mm pitch package. 80QFR31-84PL-SMT-80C188EB 80 pad Interposer correction adapter for 84 pin PLCC 80C188EB microcontrollers to 80 pad QFP . 80QFS26-84PL-SMT-K4 80 QFP pad Interposer correction adapterfor 68HC11K1 and 68HC11K4 from PLCC socket to 80 pad QFP. 84QFS25-PL-SMT 84 QFP pad Interposer correction adapter to 84 pin PLCC socket. Inside pads maximum tip to tip, 18.3mm (0.720 inch). Inside pads maximum tip to tip, 22.1mm (0.870 inch). 176QFS20-160QFS26-SMT-SD-1 176 TQFP Pitch Interposer correction adapter from 0.5mm PCB pads to 160 pin component package 0.65 mm pitch.